Move over Imelda Marcos, there’s a new pair of shoes in town! Actually there are ten, and each one is a rare, valuable collector’s item in its own right. But really, it’s not the shoes that make the woman as much as it is the diamonds that make the shoes. Why are there multi-million dollar shoes here? Let’s just say that with these pumps and stilettos, the carats come in bunches – great big bunches. Oh yeah, bling out those feet baby! This pair of Nike �So Cal� Air Force 1 �Supreme Max� trainers works with 11 carats of chocolate-colored diamonds outlining the Nike swooshes. 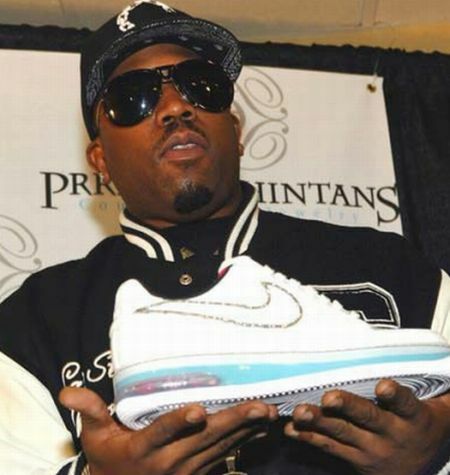 One of the only two menswear shoes represented in the top 10, they were purchased by Outkast�s Antwan �Big Boi� Patton. The Nike limited editions were customized with the fancy coloured diamonds by Laced Up owner Ernel Dawkins and C Couture boutique owner Rita Patel. This rare pair of slippers, once worn by the Indian prince Nizam Sikandar Jah of Hyderabad in the 18th century, is encrusted with rubies and diamonds. In January 2006, the jeweled slippers were stolen from the Bata Shoe Museum in Toronto, Canada yet were quickly recovered thanks to an anonymous tipster. Experts examined the shoes and believe no damage had been done� �though there is evidence the shoes have been worn�. 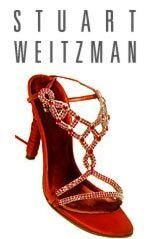 Shoe designer Stuart Weitzman and jeweller Kwiat partnered to create these stilettos adorned with 1,420 brilliant-cut colorless diamonds weighing over 30 carats and set in platinum. Anika Noni Rose, aka �the other one� in Dreamgirls, got her chance to shine at the Oscars in 2007 when she wore these �Diamond Dream� strappy sandals on the red carpet. These white silk pumps from the Innes Shoe Co. were customized by the Wizard of Oz costume department. The bows have three large red glass jewels, bugle beads and glass rhinestones in silver settings. While it is believed there were seven pairs created for 1939 movie classic �The Wizard of Oz�, the whereabouts of only four pairs are known. 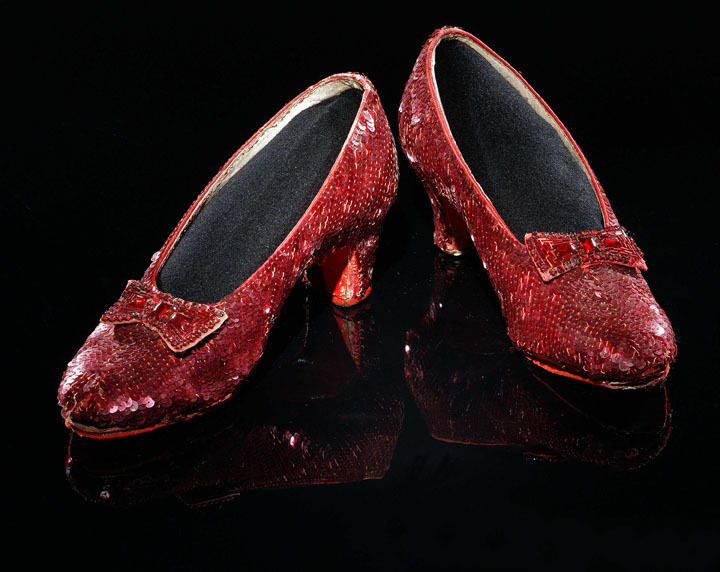 One pair is in the Smithsonian; another was stolen in 2005 from the Judy Garland Museum and has yet to be recovered. 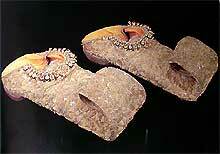 The last pair to come up for sale was in 2000, when it was sold at auction by Christie�s for $666,000. 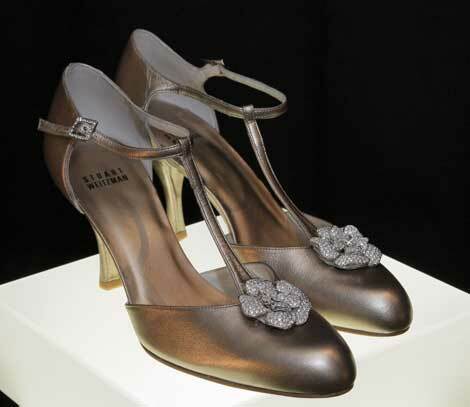 Two diamond roses are fixed to this pair of 1940s-style dusty gold high heels. More than 1,800 Kwiat diamonds weighing 100 carats were used to make the roses. Every year, fashion footwear king Stuart Weitzman picks a new and rising star, a �Hollywood Cinderella�, to wear his latest multi-million dollar shoes to the Oscars. In 2008, he selected screenwriter Diablo Cody to wear the $1M heels known as the �Retro Rose� down the Academy Awards red carpet. Ms. Cody initially agreed to wear them but later backed out after critics questioned her �Indie�, anti-Hollywood cred for participating in a glamorous publicity stunt. She opted to wear an unnamed brand instead. A startling 464 Kwiat pear and round-shaped diamonds set in pure platinum thread top off these strappy stilettos. Actress Laura Harring was the first Stuart Weitzman �Cinderella�. 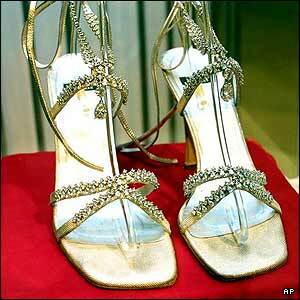 She was chosen by the shoe designer to wear the �Platinum Guild� diamond encrusted sandals to the 2002 Academy Awards. Even more than her three bodyguards, the shoes were a perfect companion to the $27 million dollar necklace she also wore to the awards show. 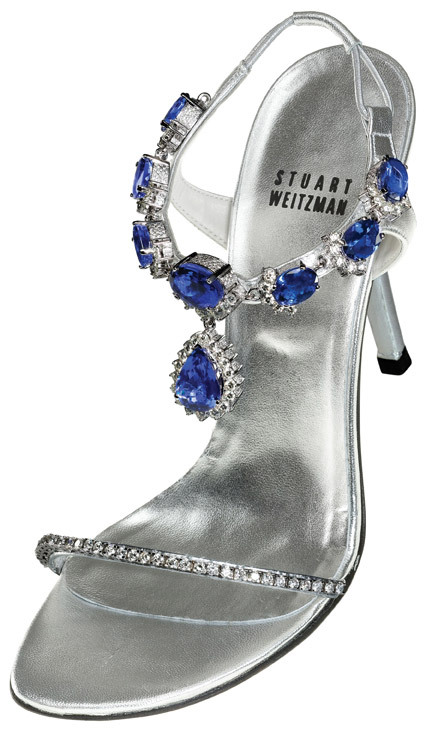 Stuart Weitzman teamed with jeweller Le Vian to painstaking match and cut 185 carats of museum-quality tanzanite and 28 carats of diamonds. These eye-popping, $2M kicks were unveiled June 2008 in Las Vegas. No one has been photographed wearing them yet; it�s speculated that Mr. Weitzman created them for the Academy Awards in 2009. Legend Stuart Weitzman designed the satin open toe stilettos around a pair of earrings owned by movie legend Rita Hayworth. The earrings are laden with rubies, sapphires and diamonds. For the 2006 Academy Awards, musician and Oscar-nominee Kathleen �Bird� York was tapped to wear Stuart Weitzman�s latest over-the-top creations. The shoes �centerpieces� were diamond and precious gemstone earrings from the estate of late 40�s movie siren Rita Hayworth, and now belong to Hayworth�s daughter, Princess Yasmin Aga Khan. Although I find the info interesting, I’m so keen on the diamond dream sandal and all of that, and i am always interested in very advanced work and designs with the stylish look. Hey I think you have a great blog going here, I found it on Bing and plan on returning regularly – thanks! OMG – who actually buys this stuff? some people just have too much money for their own good!